I absolutely love this latest obfuscation by the warmers. 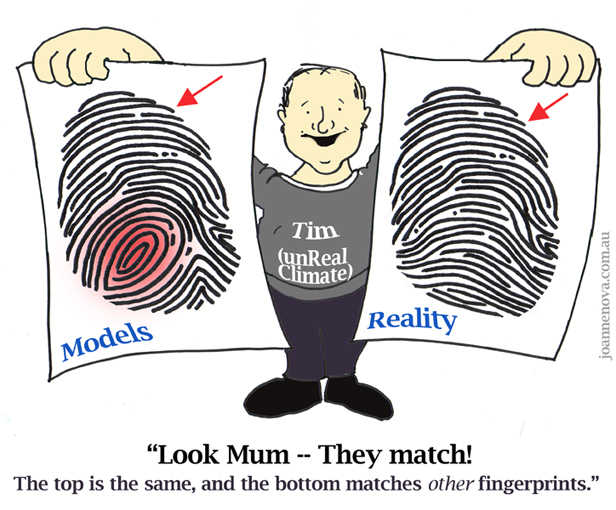 They claim that the hot spot can be caused by any warming so is not a fingerprint. OK, so ANY WARMING CAUSES THE HOT SPOT!!! Where is it?? If ANY warming causes the hot spot according to the BEST MODELS OUTPUT, and we WARMED over the last 30 years, shouldn’t we see a hot spot???? Is this what they want us to take away from the discussions of the usefulness and reliability of the models?? I wonder which genius, at debating, in the warmer camp actually came up with this one!! You don’t get it. If you look at the diagrams, the ‘signature’ is that there will be cooling in the stratosphere, while the troposphere warms. That is, other forms of warming would not have the stratopsheric cooling. It’s a pretty significant difference, since intuitively you would expect the stratosphere to warm slightly. The cooling effect in the stratosphere is predicted by AGW theory, and verified in practice. The cartoon at the top of the page indicates the author does not understand that. Joanne already pointed out that stratospheric cooling also results from things like ozone depletion. That said, no serious skeptic disputes that CO2 will cause some warming so we all would expect to see some stratopheric cooling given the amount of CO2 we put into the air. However, the question we really care about is what will happen to the surface temperatures. The climate models tell us that the surface warming will be large because of strong water vapour feedback which will have its strongest effect in the tropical troposphere. But the data does not show that this feedback is occurring. The only reasonable conclusions we can draw from the data is the models have not modelled the water vapour feedback processes properly or that the effect is too small to be detected. In either case, that means the climate models do not give us useful information about future changes. To put it another way: observing strospheric cooling tells us nothing about the model’s usefulness for prediction surface temperature changes. The ozone levels have been depleted at the poles, not the tropics. No. The cartoon shows that I know what the meaning of a fingerprint pattern is. Do you? Is it hard to understand that both stratospheric cooling AND tropospheric warming make up the pattern for CO2? Without either, the result is a negatori for CO2. When is half a fingerprint equal to a whole fingerprint? PS: Better tell the IPCC. The graph with ozone depletion creating stratospheric cooling over the tropics is theirs. See my hot spot post. I agree the use of the terms Fingerprint or signature were poor choices to describe an expected phenomena. However I am obviously not a word smith as those who wrote the IPCC report. ( if you doubt that statement you have failed to complete your reading about IPCC team makeup) The natural variation in the ozone surronding the earth has been observed by sat for some time. The true extent will not be known until sufficent data has been aquired (IOW NOT IN OUR LIFETIME). We can all make guesses about the future but we will noot know the future until it has become the past. I do not care what letters are behind a name there are only WAG, EWAG, and SWAG. Joanne, you’re absolutely right. And here’s the question I continue to ask of alarmists: if the debate is over (according to Profit Prophet Gore), why do they continue to engage skeptics? Is it just the ego-bruising that takes place on a daily basis? Michael Duvinak, the trouble is non of the chief Gori (pronouncer Gor-hi as in Stargate SG1 “hallowed are the (G)Ori”) Priors, including Big Al and Little Jim, will debate anyone in public. My understanding is the “fingerprint” is that the warming in the tropical mid troposphere should be higher than the surface, the relative difference in change in temerature is the point, not the absolute temps. If both change by the same amount it shows no greenhouse effect. I come late to this discussion so I apologize if I am repeating the point. The overall effect of increase in H2O should be (is) negative due to increase in cloud cover. I have learned that the environmentalists are using dihydrogen monoxide. This use may be affecting their thought patterns. As I understand it the use of this chemical in proper amounts is known to be benifical. But over use or Breathing this may cause problems. I think we should ask the UN to look into the harmfull effects of excessive dihydrogen monoxide. I also understand this is a far greater problem than rising levels of CO2. – People continue to engage skeptics becuse the inetia they fuel among decision makers can kill innocent men, women, and children. Examples involving other issues are rampant throughout history. I love your post; hilarious! Yes, someone should immediately do something about that nasty dihydrogen monoxide before it’s too late, lol! your comment that the ozone levels have been depleted at the poles is real news. Whew, thank God someone caught that, lol. It isn’t that important. Know why? Because as long as we have sunlight and oxygen, we’ll have ozone. It is created by the reaction of certain wavelengths of UV (from the sun) with the oxygen molecules in the upper atmosphere. Ozone is not in finite supply. So please, stop with the hysterics already. – What makes you think Bugs is worried about that? Be specific. CMB, OK, just for the sake of conversation I’ll stipulate that the planet is warming and that we are causing it via adding C02 to the atmosphere. Now, let’s talk about the impacts of a 3-5 degree (celsius) rise in global temperature over the next 100 years or so. Why will this cause the end of civilization? Why are almost all the predictions of future calamity? Claims that the only habitable place left on earth will be the south pole are obviously wrong. Claims that tropical diseases will spread out of control are obviously wrong. Claims that all the ice at the poles will melt and cause a 100-200 meter rise in ocean levels are obviously wrong. These are just a few, but I can easily cite others; just watch “An Inconvenient Truth” for more ridiculous examples. All of the predictions of future disaster due to warming are based on flimsy data and dubious logic making them easy to debunk. This is the weakest point to the AGW argument, that a few degrees of warming will be bad for mankind. There’s more evidence to say that increased CO2 and warmth will have a net positive effect. Personally I’m more worried about the next ice age, which I have no doubt will have a deleterious effect on our species. It is amusing that since the original understanding of the hot spot has failed to produce a real live hot spot.They now rationalize on what is really understand what the predicted hot spot is supposed to be. I think this is called “Moving the goal post” or something like that. When AGW believers do that.Then I know they are running on empty. Ozone cools the lower stratosphere. An enhanced greenhouse effect cools the upper stratosphere. Oops. ozone depletion that is. Oops. Me – Think this these posts are in the wrong thread – sorry Jo. You know, the AGW denial industry is flush with cash. So if any of you deniers haven’t received your check you need to complain to the front office. It’s not fair that some of you get the fat checks when you are all equally competent. Love to get my hands on some money Unfortunately I think the money is with the woolly headed sheep, not the Maverick’s. About$50 billion to one I understand, although I’m sure no one in their right mind would give a doughnut like me any` money anyhow. Lol. Upper stratospheric cooling is no doubt a fingerprint of CO2 warming. But as Lindzen has repeatedly pointed out, the missing tropospheric “hotspot” would be a fingerprint of positive *water vapor* feedback. Nearly the entire basis for alarm is predicated on the *assumption* that water vapor substantially amplifies CO2 temperature forcing. The significance of the absence of a hot spot is the implication that water vapor feedback may be small or even negative. *All* of the alarming models incorporate an *assumption* of strong positive H20 feedback, so the lack of a tropospheric hot spot is a very big deal indeed. Upper stratospheric cooling coupled with little or no tropospheric warming implies that the models are right about CO2 forcing but wrong about H20 amplification. Excellent efforts, always dominate with your nice posts. I don’t think any of you skeptics understand the point. We are not claiming the expected warming is there*. What we are making clear is that any cause of warming, whether solar caused, a reduction in aerosols, rising greenhouse gases, etc is expected to cause a hotspot. Therefore the skeptics argument is against a general expectation of climate science, not against a specific expectation by some “AGW theory”. Ie a missing hotspot would be just as much as a theoretical argument against solar caused warming as it would be against greenhouse gas warming. *Of course current data is good evidence for the hotspot’s absence, but it given uncertainty in the data it isn’t definitive. Also the assumption that a missing hotspot falsifies AGW is a little premature. Creationists were citing missing transitional fossils as falsifying the theory of evolution, but what happened was that the theory was modified not falsified. There is a good point in this subject for skeptics to realize another one of their arguments are flawed. If climate models could be “tuned” as easily as some skeptics claim, and climate science is all “group-think” and “team driven” as some skeptics claim, then how do such skeptics explain why scientists haven’t just “tuned” the hotspot out of the models to bring AGW into obvious alignment with data? Hi Bob, “Why haven’t they tuned the hot-spot out the models?” Easy. It wipes out 2/3rds of the warming. A model with no water vapor feedback is a model that says carbon will only cause a very modest warming. 1 degree. No crisis. No need to trade. Who cares? There is no comparison with us and the creationist argument you quote. They were poking a hole in evolutionary theory because: there are lots of fossils, but not a fossil for every different adaptation or mutation. The absence of a hotspot is not like a fossil that hasn’t turned up, but might. We FOUND evidence that their theory is wrong. The hot spot is a prediction their theory makes, which we tested for and with the best of all our equipment and hundreds of thousands of measurements we found that the air was a different temperature to what their theories suggested. That’s not a “missing” fossil. That’s a fossil that would blow away evolution (which has never been found). And this line of thought? “We are not claiming the expected warming is there*. This is obscuring the point post hoc. Yes, any form of warming should in theory raise water vapor levels, but the world warmed, due to who-knows-what, and water vapor levels didnt rise. That part of the IPCC theory is wrong. But so the bad prediction they specifically made is now OK, because even though it’s wrong, it could’ve (but didn’t) apply to other causes of warming? this is what you’re trying to convince us of? Which is good evidence that the models cannot be manipulated or tuned to show any result. Or else they could be tuned to show all the warming and also no hotspot. So given there are physical constraints in the models, is it even possible to remove the hotspot? Perhaps removing water vapor feedback would require violating currently understood physics. And even if it was possible to remove it, would removal of the hotspot in models lead to a model that better represents the climate? Neither of these questions bear on manmade global warming at all, they are general climate physics questions. This is because a missing hotspot is a fundamental problem for climate physics in general. And that’s my point, dismiss manmade global warming and the hotspot problem is still there – problem not solved. In the case of the theory of evolution it was found there were too few transitional fossils in the record compared to what the theory expected. In this case it is found there is too little warming in the upper tropical troposphere than should be there according to what theory expects. Bob you seem to be arguing from the “Climate Models know physics and chemistry of gases in test-tubes, therefore they must be right about the entire planetary climate.” Doesn’t follow. In the real world humidity turns into clouds, rain, hail or snow. The models are not good at predicting that because atmospheric science just isn’t advanced enough to know. Can they “turn down” the feedback? Easily. All they have to do is use results from peer reviewed papers that suggest the feedback is negative instead of positive, (which was an assumption based on their best guess using test tubes and high school chemistry). Don’t think anyone has done that test. Would be good to see. It would certainly better predict upper tropospheric changes which the models have failed at dismally. Actually, I seem to remember people like Spencer have made small models that do work well. When someone finds the money to fund models that are willing to consider other causes of warming or feedbacks based on empirical evidence I guess we’ll find out. Until then, monopoly science will keep defending it’s poor ability to predict anything. I suspect it’s either not possible to turn down the feedback in models within the constraints of physics, or that attempts to reduce the feedback have only led to a poorer representation of the climate. Either would explain why such a low sensitivity GCM hasn’t been demonstrated. Papers that estimate climate sensitivity from observations typically provide just that and do not also provide a physical mechanism to achieve that. Therefore whether such estimations are of low or high climate sensitivity they do not provide any means to change the models. It would require a groundbreaking discovery in underlying climate physics to change GCM climate sensitivity it seems. Bob @ 33: Papers that estimate climate sensitivity from observations typically provide just that and do not also provide a physical mechanism to achieve that. Therefore whether such estimations are of low or high climate sensitivity they do not provide any means to change the models. Question: Is reality determined by equations (computer programs) or should the equations (computer programs) be determined by reality? If the equations are in control, then why are the estimated climate sensitivities from observations different from those found in the models? It would seem that if the equations are in control, the modelers can have it any way they want and reality must obey. Yet this is not found to be the case. Is it not the responsibility of the modelers to conform to reality? Those who show what reality actually is are not responsible for the errors in the models. They therefor need not offer corrections for the models. They need only show the model does not reflect reality and is therefore not a model of reality. The modelers might continue using their models but, by doing so, they study only their models and not reality.